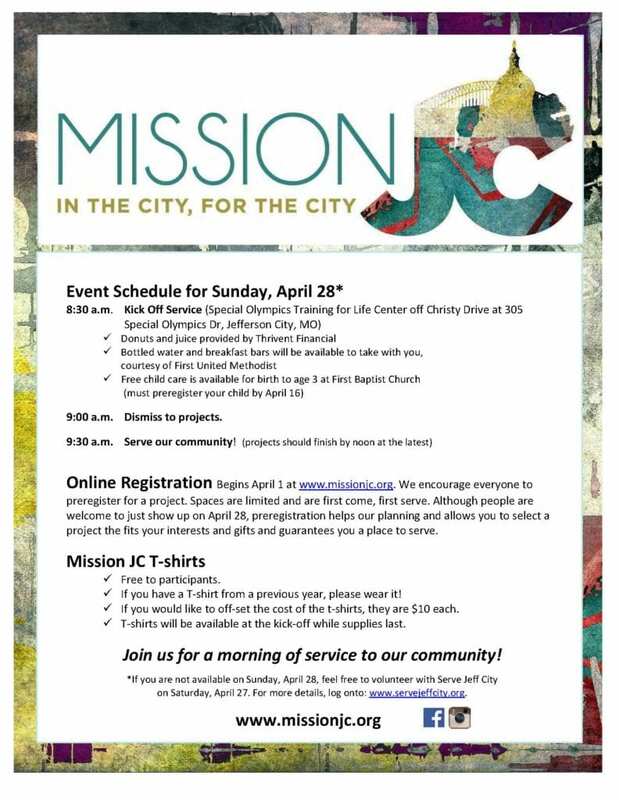 Mission JC: In the City, For the City is a morning of worship through service in our community on the last Sunday of April. 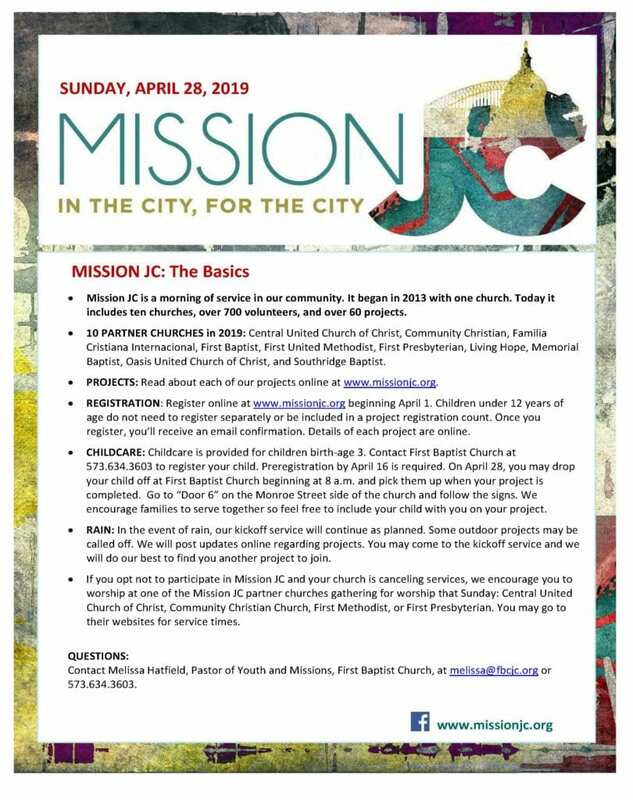 Please visit the Mission JC website (missionjc.org) for more information and registration. Below is the history of how Mission JC began at First Baptist Church. Download the 2019 flyer here (also view below). And be sure to register here. First Baptist Church, Jefferson City, has long realized that part of true church ministry takes place outside the four walls of the church, and not just within it. 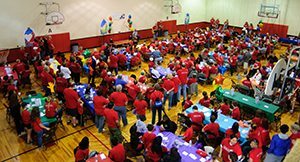 From 2009 – 2011, our first attempt at a large-scale effort to minister throughout the community was called Sharefest, taking place on a Saturday each year. In 2012, our church took that desire a step further in asking ourselves the question, “How can we give ourselves away?” as we sought to embrace the truth that the church is a sent people – sent by God to move into the neighborhood and be the presence of Jesus. A task force was created to develop and implement ways we could move the church forward in our understanding that we are not here for us but to be salt and light in our world. What if we reminded ourselves that we are a sent church by canceling our worship services one Sunday each year and worship through service instead? Sunday, April 28, 2013 was our first Mission JC. We had nearly 300 participants and 24 projects – all from First Baptist Church, Jefferson City. Mission JC was a huge success. 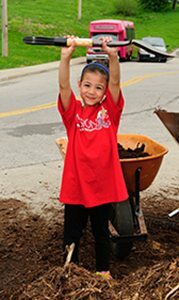 We purchased red t-shirts for everyone to wear and it made a huge visual impact throughout the community. The volunteers met at the First Baptist Activities Building at 8:00 a.m. for breakfast and a time of commissioning before going out to serve through various projects. After the event, we created a website (www.missionjc.org) and used it to promote Mission JC for 2014. In 2014, we held our second Mission JC on Sunday, April 27. We had nearly 450 participants from three churches and 42 projects. First Presbyterian and Familia Cristiana Internacional joined us. Again, Mission JC was a blessing and we received nothing but positive comments, feedback, and ideas for improving it for 2015. In 2015, we held our third Mission JC on Sunday, April 26. We had over 450 participants of all ages from at least five churches. (First Baptist, Familia Cristiana, First Presbyterian, First Methodist and Central United Church of Christ). 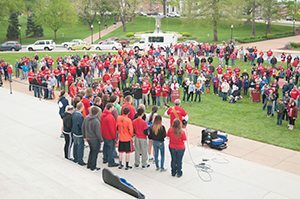 We met at the Capitol for the first time in order to accommodate the growing number of participants and to truly embrace that this was a community event led by several churches. We celebrated Sunday night with a worship service and meal at First Presbyterian Church as we shared stories from the day. 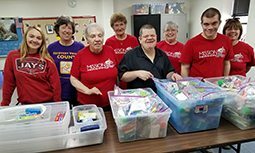 In 2018, we had over 700 participants from eight churches (First Baptist, Familia Cristiana, First Presbyterian, First Methodist, Central United Church of Christ, Community Christian, Southridge Baptist, and Memorial Baptist). We moved our opening kick-off service to the center court of the Capital Mall. God continues to bless this endeavor and the ecumenical spirit of Mission JC. We can do so much more together than we can on our own.